No doubt the task of cutting dog’s nail becomes challenging if it is not carried carefully and accurately. It is crucial that while trimming the dog nails you don’t cut the nails very short or cut the quick of the nails otherwise it will cause great pain to your dear pet. If you find trimming the dog’s nail with clippers is the scary job, then I will provide you the stress-free method in which you can cut the nails of your pooch without using clippers. Let’s move ahead to explore the knowledge and understanding of how to trim dog nails without clippers. How to Cut Dog’s Nails Without Clippers? You can make use of Dremel tool to trim the nails of your four-legged friend. You can buy the Dremel tool or nail grinder from the vets or the pet stores. In the beginning, your canine may feel uncomfortable to the sound of the instrument, but slowly and gradually with time, your pet will get familiar and comfortable with it. While performing the nail cutting task, you may offer him some treats so that he gets motivated. It would be more helpful if you trim your pet’s nail when he has gone through some physical activity. If your pet is tired of bodily exercise, then at that time he can easily stay inclined to the clipping of the nails. So appropriate timing will make your pet’s nail cutting task easy and quick. In case you find the hair around the toes of your doggie then get it removed so that you can quickly approach the nails of your pet. The Dremel tool runs in the circular motion so to avoid any destruction it would be worthy to get away with the toe hair of your pooch. Gently hold your pet’s paw in your hand and then make use of Dremel tool on each nail firmly. Around the tips of the nails softly run the device in the circular motion. If your pooch feels uncomfortable, then you pause and wait for some time to make your lovely canine calm and comfy. You can also take the support of the helper to avoid any difficulty while trimming. The helper will make the nail trimming task simple and easy. Make sure you don’t trim the pet’s nail too short. You can check the comfort level of your pet by cutting one toenail and then checking the reaction of your beloved pet. If you find that your pet is at ease, then you can continue the process of the Dremel tool on other toenails too. You can also try manual filing for your pet. For it, you can make use of scissors or hard metal file. The nail files meant for doggies can be found in any pet shop or from the veterinarians. While manual filing you have to follow the same guidelines which are discussed for applying the Dremel tool around the pet’s nail. Generally, pet owners don’t depend on manual filing as it is time-consuming. 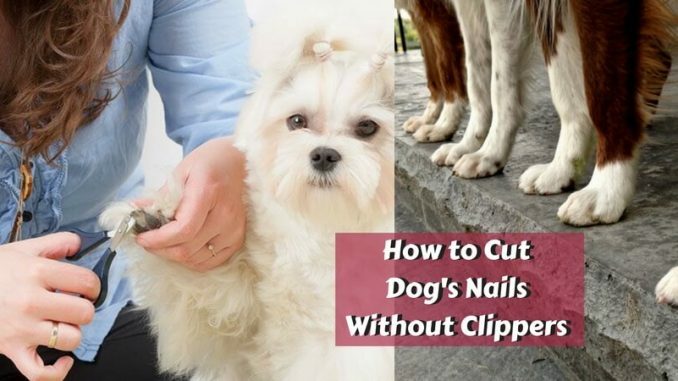 From this article, you can make out how to clip dog nails without clippers. All steps are easy and simple to follow. Now you can DIY dog nail trimming at home without taking help or guidance from the expert or professional groomers. The clippers produce the lot of pinching sensation to your loving pet so to get rid of the mess, the application of Dermice tool will be boon to your pet. You keep precious pooch well-groomed by keeping their nails trimmed and well maintained. Ensure you regularly trim your pet’s nails. If while cutting the nail your pet gets hurt accidentally then no need to get panic, you can consult vet just to verify that your pet is in the sound condition of health and body.